Electra-Tec, Inc. workbench’s unique design enables it to be easily assembled at the site. This can save a substantial amount of time and money. All assembly is performed with basic hand tools. The assembly is typically accomplished without removing the base cabinet drawers. Base cabinets and legs come with weldnuts installed for easy mounting of the footrest. Base cabinets and legs include floor levelers at each corner/end for uneven floors. 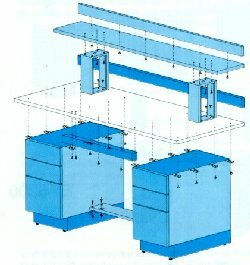 Cabinets are secured to the bench top with a hold-down brackets on each side as shown in the diagram above. Shelf supports have removable side panels and are secured to the shelf and top with enclosed hardware. Please see the PDF link below to preview basic assembly instructions.